Whislt MultiToolTB provides basic service rest functions as well as ODO winding for standard Multistrada 1200's, it's main benefit is that it is designed to run in conjunction with the TuneBoy firmware for Multistrada 1200, Panagale and Diavel, the Ducati Data Logger reads and records the engine data, and allows conversion into a format acceptable for playback in the TunBoyTrim program. 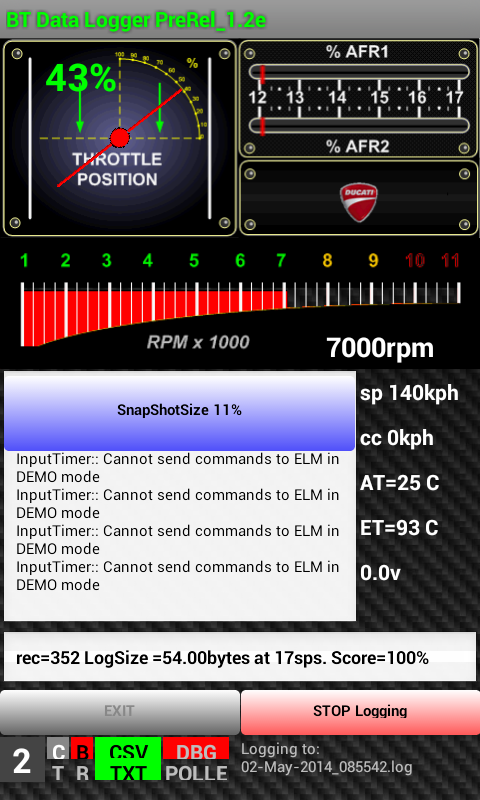 For ANDROID, it is necessary to connect to the bike's diagnostic port using a BlueTooth ELM327 device instead of the OT-2. 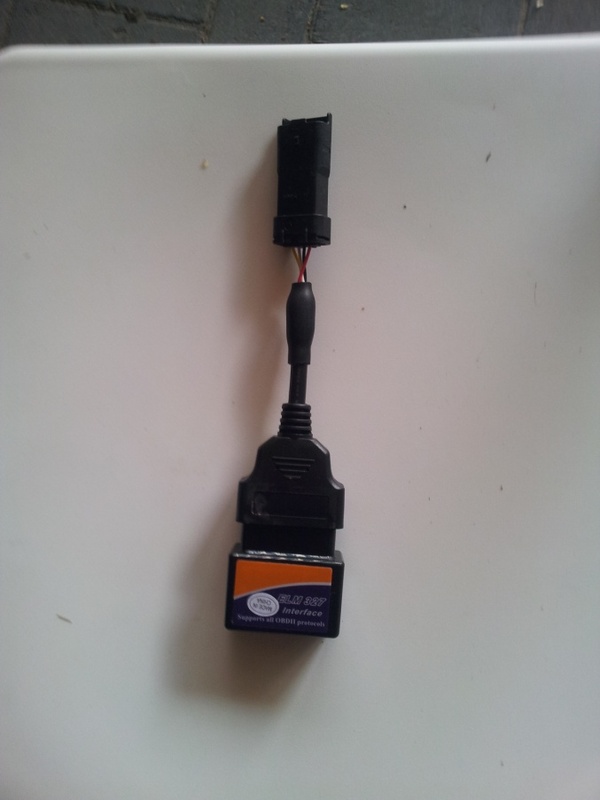 In general these will have a standard OBDII connector and will use the DDA to OBDII adapter supplied with the Tune Boy kit. Unfortunately the OT2 provides only AdHoc connections… Again, don’t ask me why …. So how do we get around this impasse ? BlueTooth obviously !! It’s cheap to implement, and Android is very happy working with BlueTooth. Blue Tooth OBDII diagnostic dongles are available frickin’ everywhere, ranging in price from about $10AU upwards. In theory the more expensive ones *may* work better, however all development work for this project has been with ‘cheap’ knock-offs from China sourced off EBAY. More recently, some WiFi ELM’s have become available that do support Infrastructure connections. CAUTION: WiFi dongle must support infrastructure connections, because Android cannot make use of AdHoc only WiFi dongles. 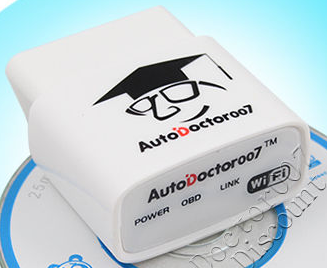 Eg: The AutoDoctor007 works great ! CAUTION: leaving the dongle attached to the bike will eventually drain the battery unless the bike is ridden or charged regularly. 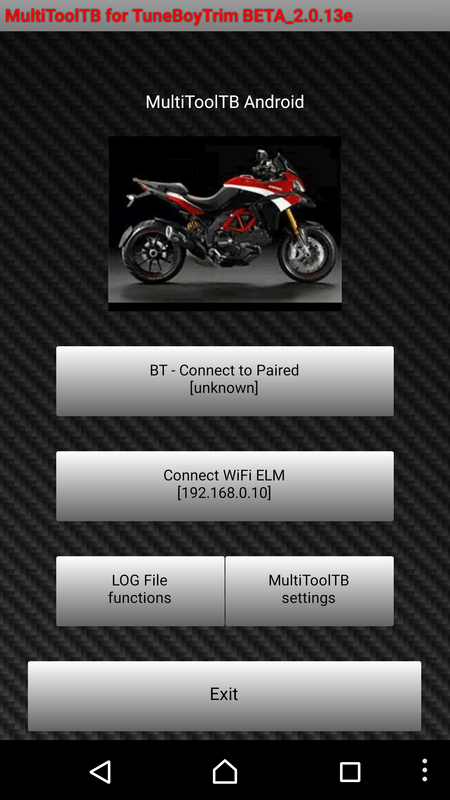 The main reason for this app was to provide an easy way for Android users to log data from the bike, similar to using, and compatible with TuineBoyTrim, but without the hassle of lugging a laptop around. In addition some simple RESET’s can also be performed as well as ODO winding (forward only). These do not require a TuneBoy flashed ECU. 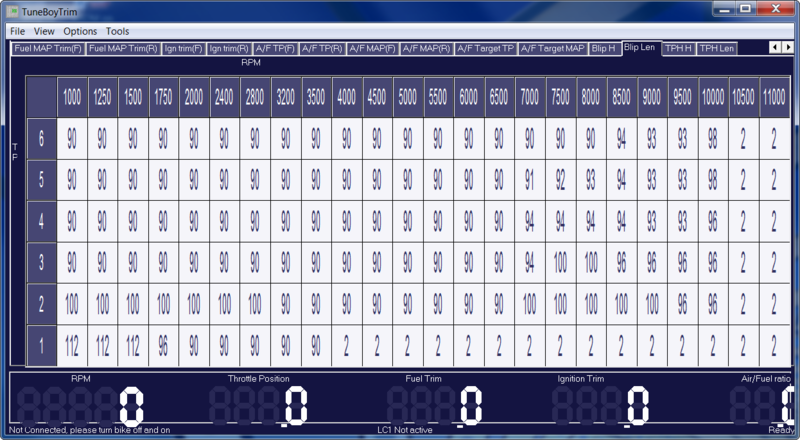 Ultimately, TuneBoyTrim is the tool to use if you want to record ALL of the performance data. The MultiTool records a subset. However the MultiTool also records information w.r.t. 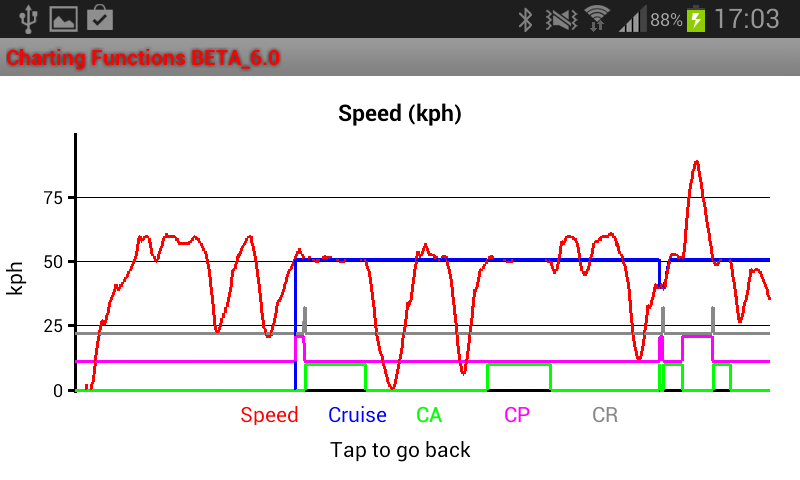 the CC function, as well as GPS position data. The log file recorded by MultiTool must to be converted into a TuneBoyTrim compatible .RAW file. 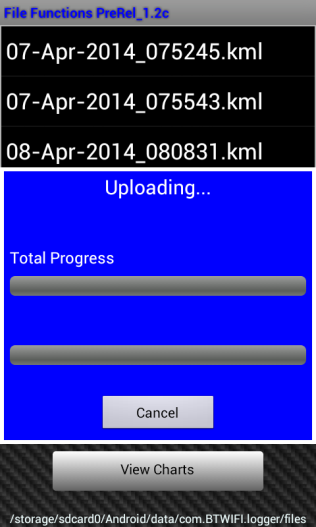 GPS positioning data is recorded as a KML file which can be uploaded to Google Maps. There is a limit to the File Size of the .LOG file. This is adjustable between 0.1MB and 50.0MB in the Config Options screen. The reason is to allow the ability to limit file size to a size that can be emailed by your provider. It’s up to you …. What DOESN’T it do ? This then brings us to the requirements for this Application. Android 2.2 or later with BlueTooth supported. It’s preferable if you can power the phone from your bike if you plan on using it for extended logging periods. (see Known issues for advice on screen settings). Connect to WiFi ELM : connects to a WiFi ELM device. WiFi Settings : allows some customization of WiFi settings. 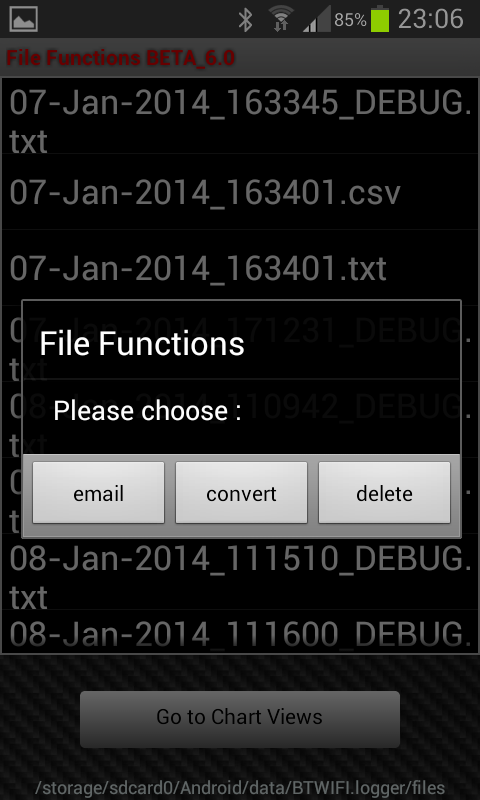 Log File functions : Allows you to choose a log file, trace file, or even debug file and email to yourself, (or someone else even)… as well as convert data into TuneBoy compatible .RAW files. 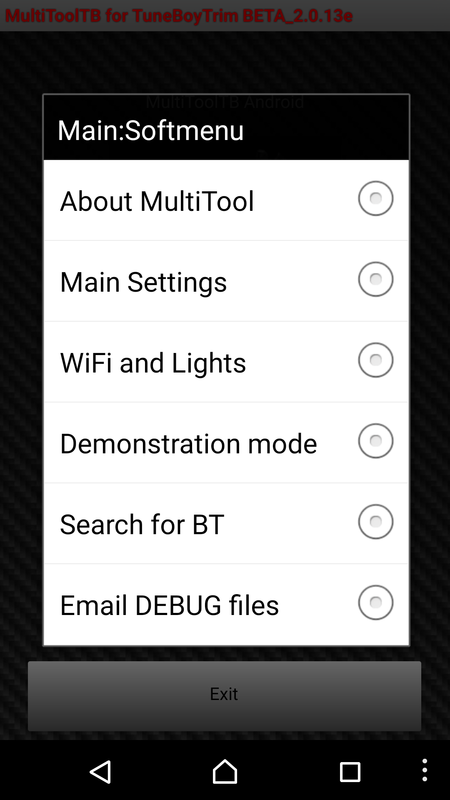 MultiToolTB Settings : personal and system settings etc. 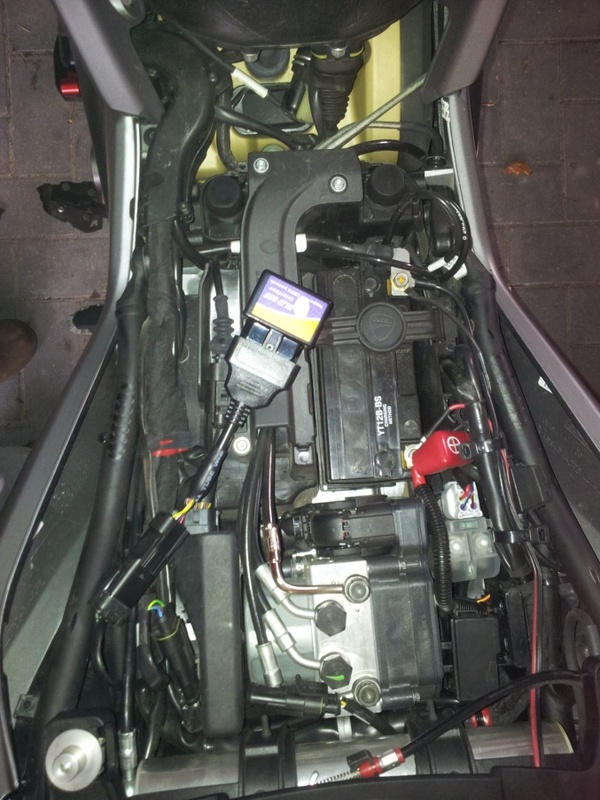 Although the BlueTooth ELM327 powers up when plugged into the bike, and you can ‘pair’ and connect to it with your phone, the application won’t actually ‘connect’ unless the bike is powered on. (Key On). WiFi users need to note that the WiFi ELM must support ‘Infrastructure’ mode connections (Not just AdHoc). WiFi users must make the phone connect to the Wifi device when it has powered up. CAUTION Leaving the BT or WiFi dongle attached to the bike will drain your battery regardless of manufacturer’s sleep modes. Two default WiFi devices are provided, (although they are actually the same in terms of address and port). I have had good results with the AutoDoctor007 with the one exception that it goes to sleep if you’re not using it, and needs a power reset to wake it up. Don’t forget, you need to connect your phone to the devices WiFi network. The AutoDoctor has one annoying habit. requires a power reset to wake up. 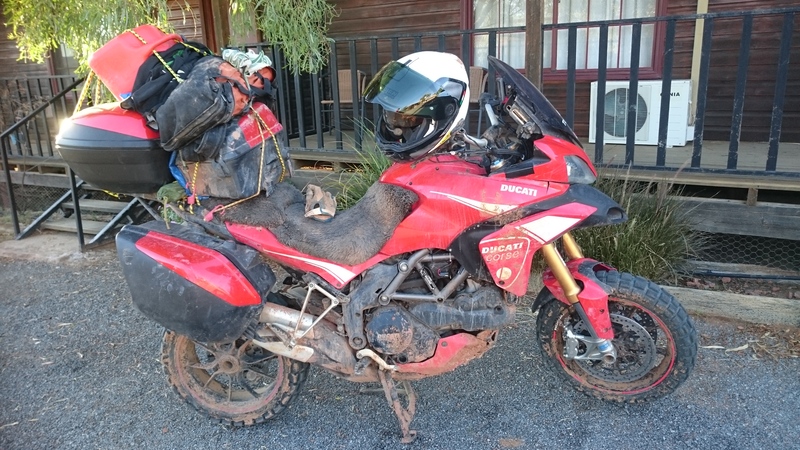 I’ve also found that even in sleep mode, after being connected to the bike for 3-4 days straight without running the bike, I had lost enough charge that I couldn’t start the bike … Doh ! About : Help and About. Demonstration Mode: Demonstration display (animation only, using bogus made up values. Drag finger across display to open TP). Search for BT : Presents a list of active BT devices for connecting/pairing. Email DEBUG files : emails the last 5 DEBUG files as one ZIP export. ABOUT offers some info about your device, the Application and your session stats. ** LongClick the Ducati Logo for Web Help. Allows you to change the image on the Start Screen from a choice of ‘canned’ images. Choosing the 'My Bike' image will make the camera icon go green. If you press the camera icon, you will be able to take your own photo, and this image will be displayed on the start up page. Eg: Throttle Position and RPM, AirFuel Ratio, Engine Temp, and the status of several key ‘switches’ on the bike… (BRAKE and CLUTCH, Like PreFlight). Log File Name : The .TXT file in use. By default a .TXT (trace) file is created. By default a .CSV file is created. It is required for Charts. 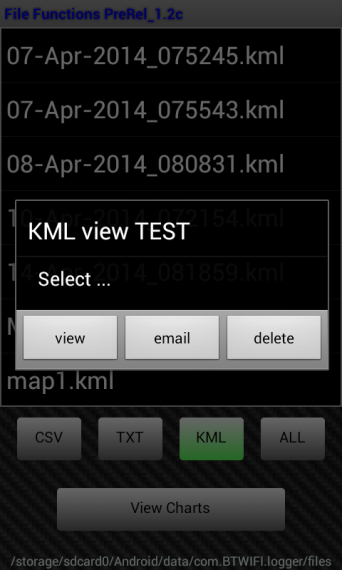 If GPS is enabled then a simple KML file is also generated. This is a linear scale showing the opening of the butterflies from 0% to 100%. 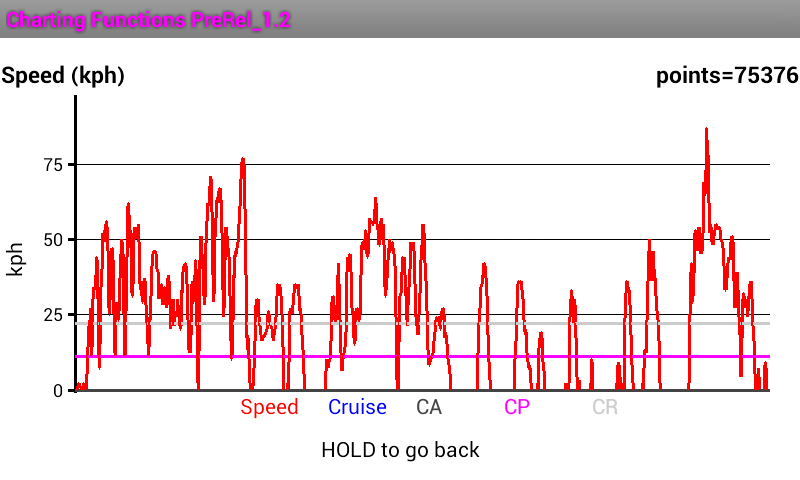 You might be surprised to see that for much day to day riding, your TP% is actually quite low. 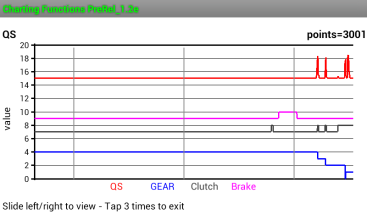 These two gauges show your Air Fuel ratio if using the O2 sensors. 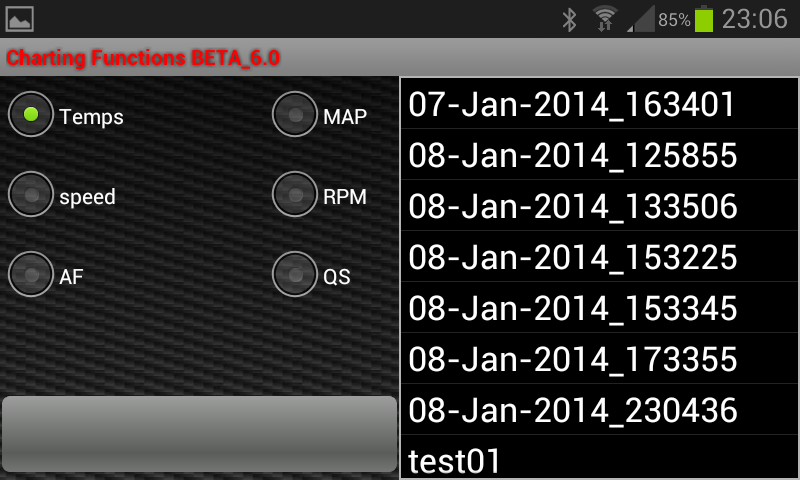 If you ar NOT using the O2 sensors then these can show the inputs from the NUDGE buttons and the QuickShifter. The Nudge gage should show a reading of 17 for no buttons held. 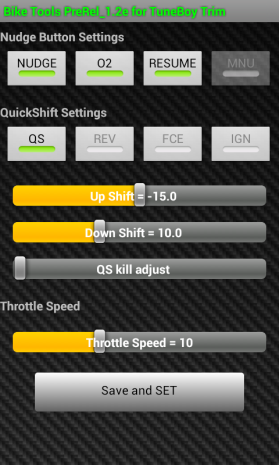 The QuickShifter gage should sit in about the middle. Shifting UP will make the needle drop down. Shifting DOWN will make the needle jump UP. To make it easier on the eye at night, and to preserve power, you can change the screen brightness through 5 levels by swiping the ‘speed, temperature, volts display’ in a downwards motion. 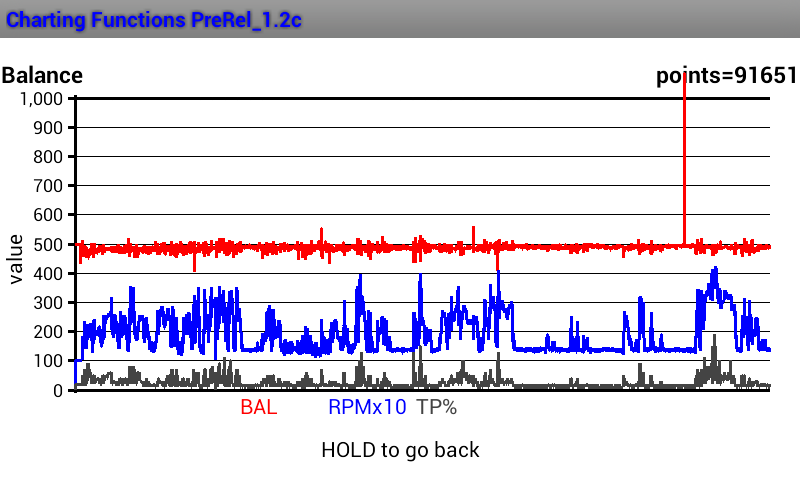 from v1.2K a new feature was added to allow a crude live view of the relationship between APS and TPS, in the form a 'live' bar chart that over lays the main logging screen. Activating the chart is done by press of the TPS graphic on the top left hand side of the screen. This allows the persistent configuration of various ‘personal’ features for the App. Now has Auto Trigger function which allows SnapShot to be taken when specific conditions arrive or even by pushing the bikes Start Button. Auto logging Start logging as soon as connected. MailTo is passed to your mail app as the recipient. Save Button to save any changes. Choose your Start Screen bike color.. or make your own ! MultiTool now ‘discovers’ what bike you have and sets several factors accordingly. You should see the bike discovered as a brief ‘toaster message’ just after the main logging screen starts up. The known models to date are : Multi 2010-12, Multi2013-14, Panigale, Diavel, Diavel DualSPark. You can now take a photo of YOUR bike for the start up screen. After selecting ‘my bike’, the camera Icon will go green. Pressing this will open the Camera control. The camera Icon takes a photo and loads it into the right place. Record the last 1 minute (approx.) of data at a button push, into a CSV file, suitable for charting. 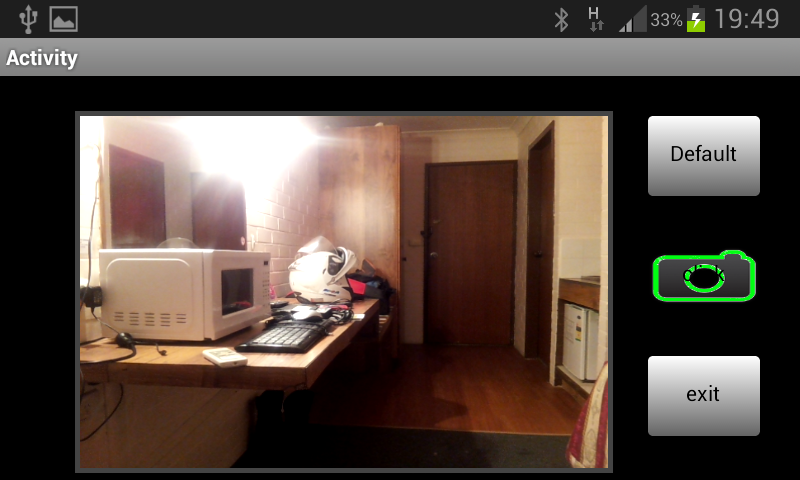 While in SnapShot mode, the top of the Log Window displays the blue SnapShot button. The text in the button indicates how much of the SnapShot buffer is full. A full buffer (100%) represents approx 1 minutes worth of data. Turning Snapshot ON in your config settings will also enable CSV. Conversely, if you disable CSV then SnapShot will also get disabled. Snapshot mode with no triggers has a BLUE button. In practice I found trying to hit the snapshot button a PIA. The obvious answer was to add triggers for specific conditions, and let the SnapShot happen automatically. Whenever you enable the SnapShot feature you will be shown the SnapShot Triggers page where you can ‘check’ on which conditions will trigger a snapshot. Just one example is perhaps ‘checking’ on StartButton. This means you can trigger a snapshot by pushing the bikes start button. 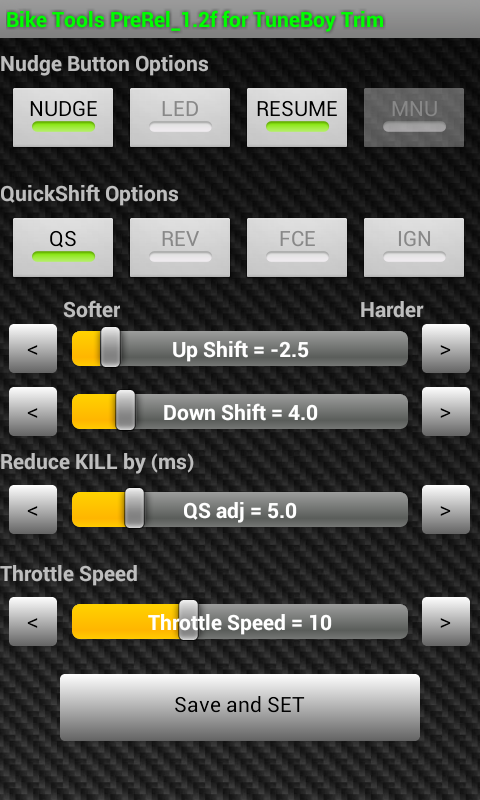 SnapShot Trigger page allows you to select one or more specific conditions that will trigger a snapshot. You can also select the delay after the event before the SnapShot takes place. The Snapshot button on the Main Screen will be green instead of blue if one or more triggers are set. The text of the SnapShot Button will be red during the period between the SnapShot being Triggered and the timer actually taking the SnapShot. 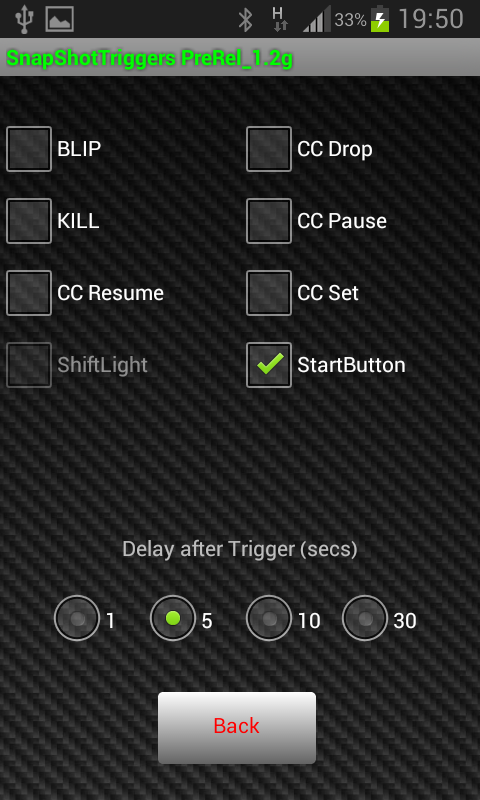 The Back button on the triggers page will have red text if one or more triggers is set. Scroll to find the file you are after and touch the required filename to initiate the allowed actions for that file type. Converting TXT to RAW can take a very long time if the file is large. Go to the Chart Views with the button. Email or Delete your converted RAW or Debug files. Note: RAW files contain only a subset of the data logged by the TuneBoy Trim program. If DEBUG is enabled then a detailed ‘DEBUG’ file is created. One DEBUG file is created per App Start and All sessions are debugged logged in it. 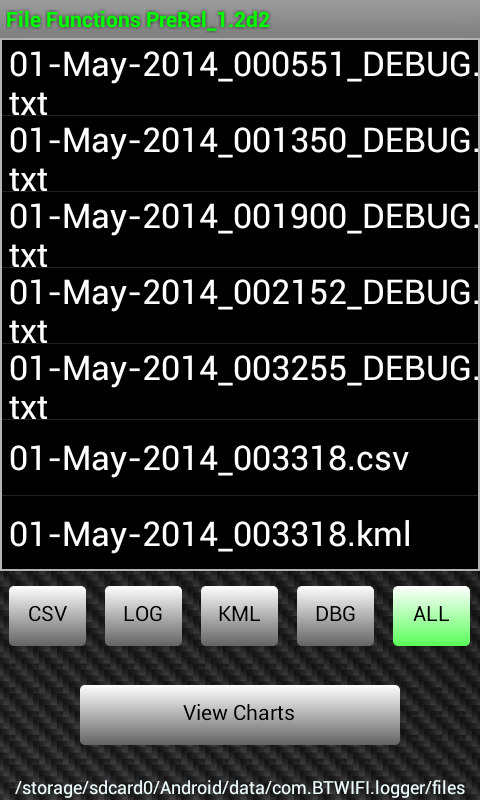 Conversley, the data log .TXT file, the .CSV file and the .KML file are unique to each logging run. MultiTool tracks your position with GPS (if enabled) and records a KML file. 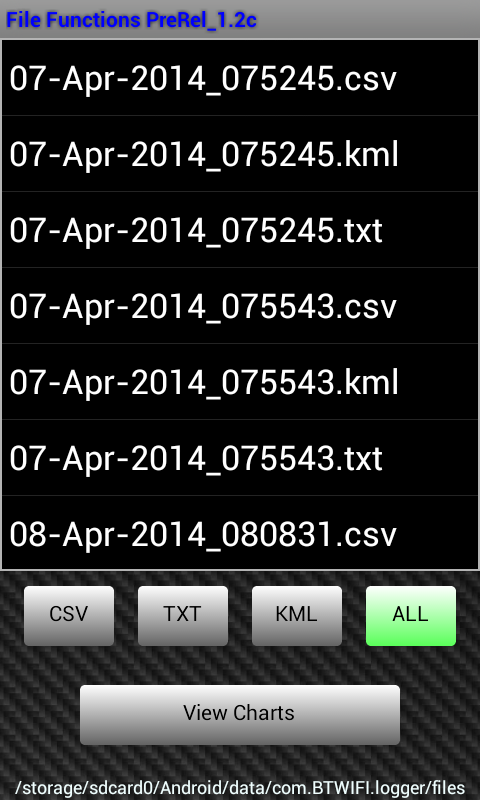 MultiTool logs your GPS position data in the CSV file, and creates a standalone KML file as well. Viewing the KML requires an Internet connection. Rudimentary charting is now available. Note: As charting uses the CSV file. You must have CSV file recording enabled. In addition to being able to connect the phone to a PC and drag the Log files to your Computer in the normal fashion, the app now supports emailing files using your choice of email client. To Email a log file, simply scroll through the list until you find the file you want to send, then touch and hold that entry . Your phone will start up your Email application with the file already attached. If you have an Email name set in ‘Config’ then this too is populated into the ‘To’ field. You just have to push whatever your ‘send’ button is. You can edit any of the fields before sending, as well as add/delete text. If you have multiple options for sending Email, then the first time you do this, Android will ask you to select one and confirm if this is the one you want to use. (Only happens the first time). The usual way of transferring files to you PC from your phone is by USB, and dragging and dropping the files in Windows Explorer. Being able to Email files is simply another way of moving files either to your own PC or even for sending them in for support purposes. While LOGGING is STOPPED you can access the NON-Logging features via the 'setting' button on the Logging screen. 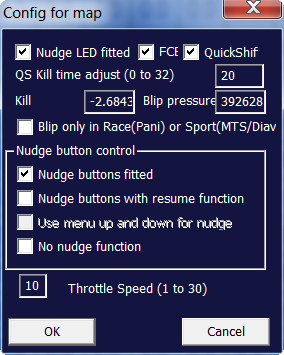 CC and Nudge Button settings. Wind ODO: Winds your ODO forward at approx 500kph. 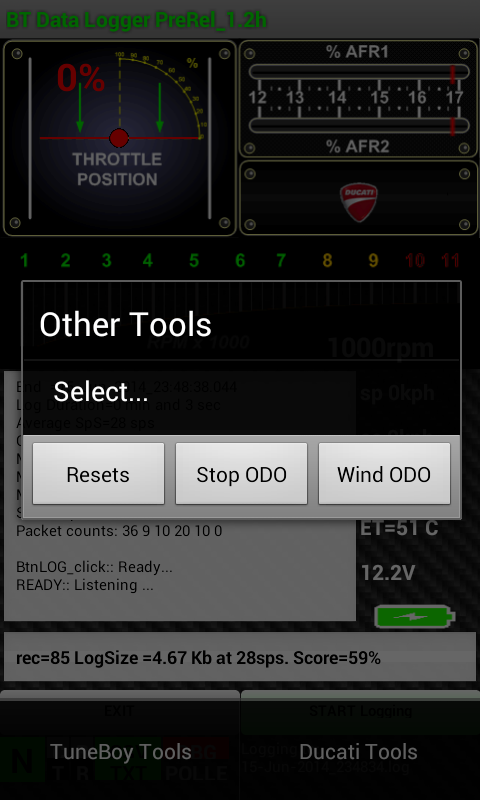 Stop ODO : Stops the winder early if you need to! The ODO can only wind forward. If you go past your target, you cannot go back. Your ODO, stops at 99,999. It does NOT wrap back to 0, and you cannot wind back. 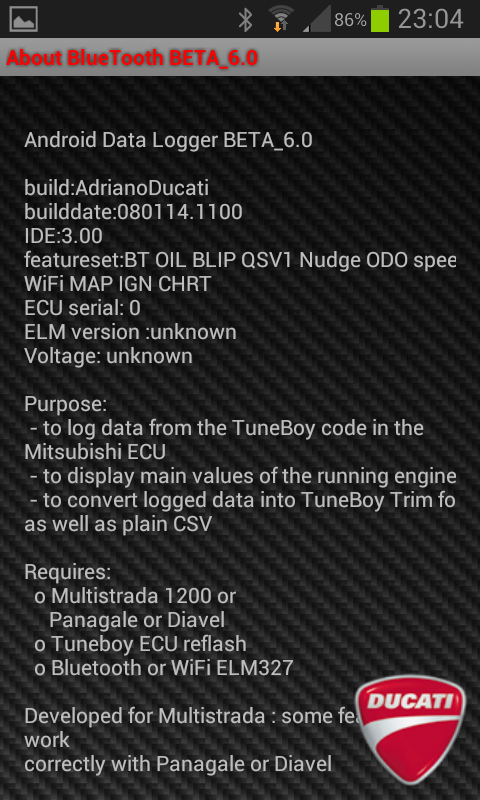 Non TuneBoy ECU’s will only see the ‘Ducati Tools’ option. In general these are commands that are sent to the bike. WARNING : Not all commands are applicable to all bikes, and not all have been fully tested. This page needs updating !! 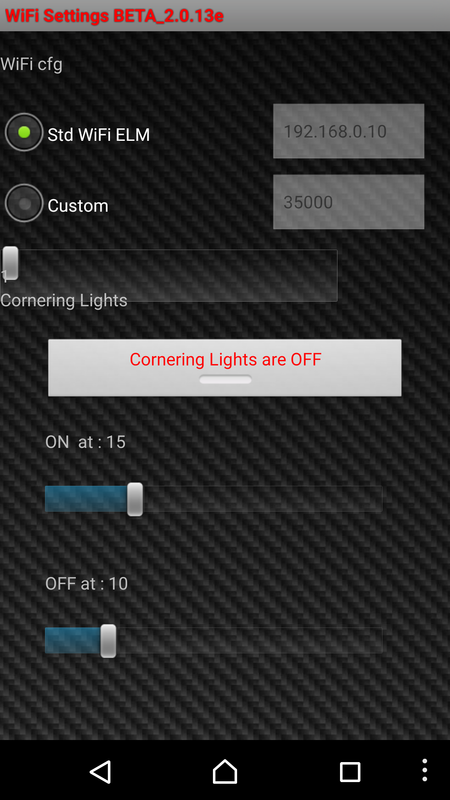 TuneBoy features for configuring CC Nudge Buttons and QS controls. 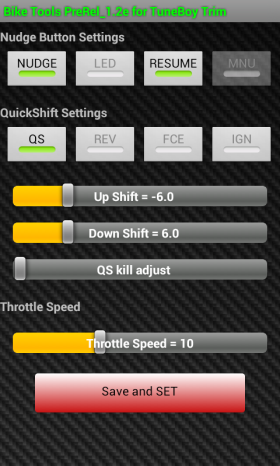 You can Enable/disable CC and QS features as well as tune QS settings. 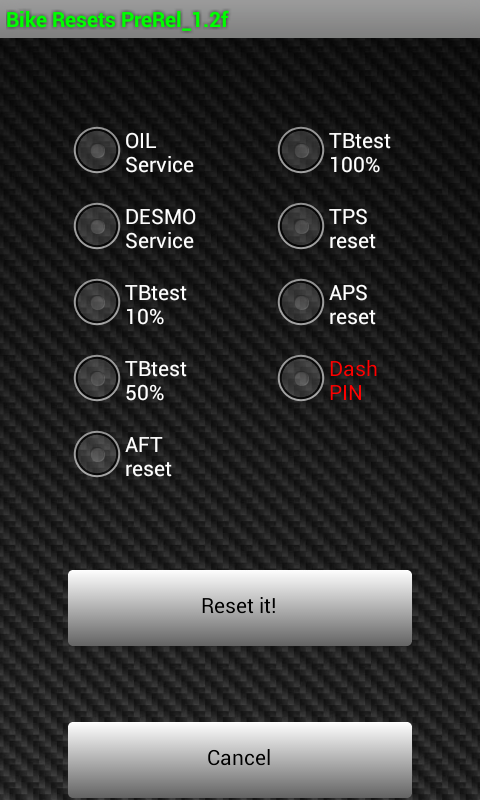 Save and SET: saves the values to the bikes memory as well as your phone. Changing any option will highlight the ‘Save and Exit’ button in red. Reminding you that you made a change(s), and should send it to the bike. To exit without sending the change, use your phone’s back button. These settings are read from the bike when the App connects and starts communicating with the bike, and again, when you access this page. (This figure is subtracted from the default KILL time to shorten the KILL time if desired). The ‘Ducati Tools’ option presents as a dialog box with three options. Wind the ODO forward at approx 500kph until specified target is reached. Stops the winder at your command. 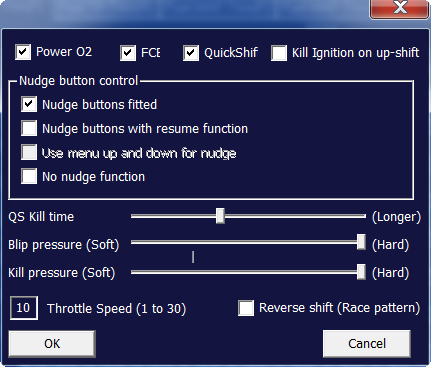 Simply canceling back from this screen will also stop the ODO winder if it is running. 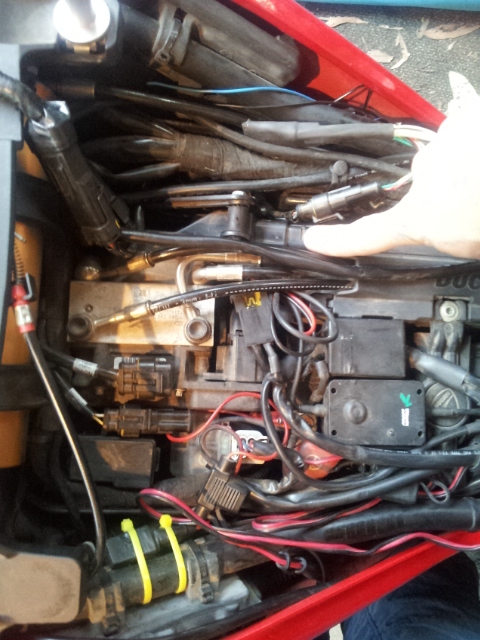 These options do not require a TuneBoy flashed ECU. Simply select the reset you want, and hit Reset it! Some of these command are bike model/year specific, and most are NOT TESTED fully. 2013 and later Multi’s use specific commands for each. Dash PIN works on my 2010-12 test bed. TPS, APS, and AFT also need to be confirmed. 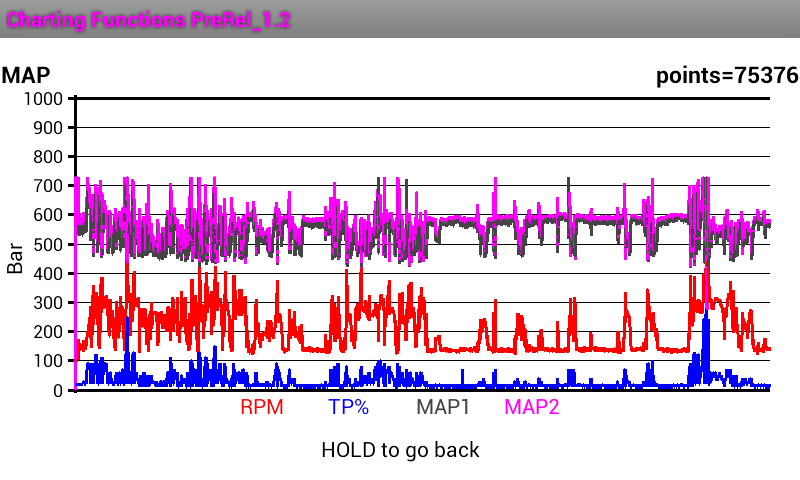 The TB test’s simply open the Throttle Bodies to that % amount for a few seconds. For the obvious reasons, MultiTool will not allow you to do this if the engine is running. It is NOT possible to reset your service interval warning before it has appeared. Ie: You can only reset it once you have reached a service interval, and the warning has actually been displayed. Some of the other RESET commands are bike/model specific. I own only a single 2010 Multi. Selecting this option will ask if you really want to do this .. Even if you say YES, you can still back out and do nothing. The feature will next ask you to enter your TARGET mileage and GO. 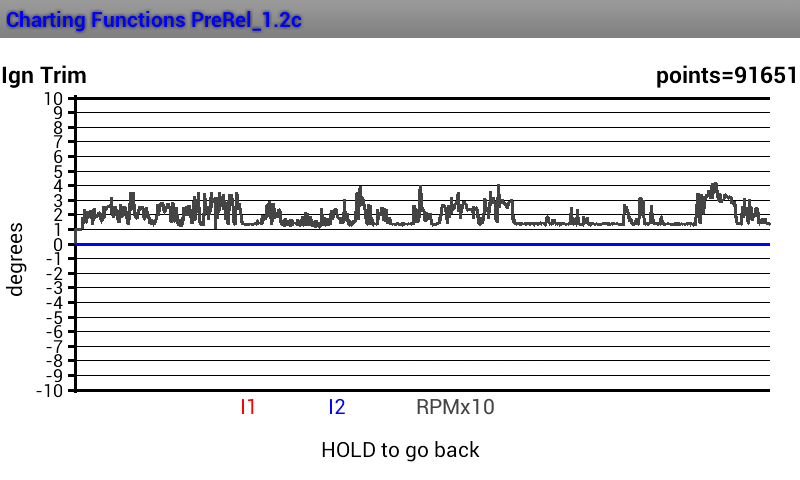 Pressing GO will take you back to the Main Logging screen, and the status of the ODO winding is reported on the Status Line. 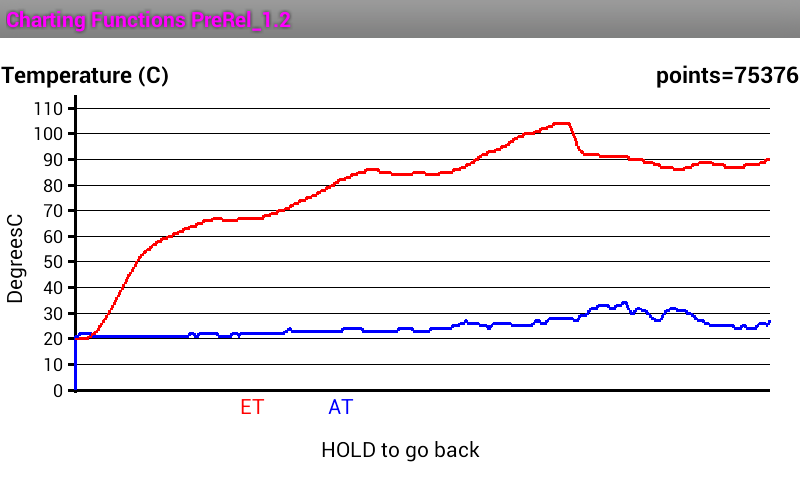 Winding stops when the target Odo is reached (usually). And can be stopped manually if required. Winding the ODO needs to have the bikes BBS computer disconnected. NOTE: 500kph sounds fast, but if you have 10,000km to catch up… this will take 20 hours! (Do it in manageable chunks over a few evenings). 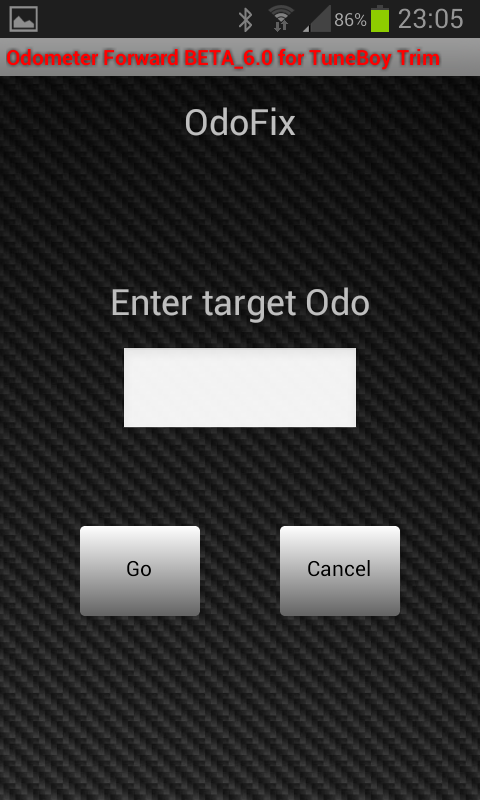 Note: The TARGET Odo value is not dependant on your settings w.r.t. Miles or Km’s. It just the value displayed on the dash regardless of the units. Ie: you don’t have to convert anything. See below for comments on how to disconnect the BBS. WARNING : You cannot wind past 99,999. Mostly solved by dumping data. Disable Adaptive Timing and Set long time out to fix ReadQS. Modify TOOLS page to align with Wayne’s format. Fixed double ‘+ve’ error in ReadQS . Fixed errors in ODOwinder if using MILES. 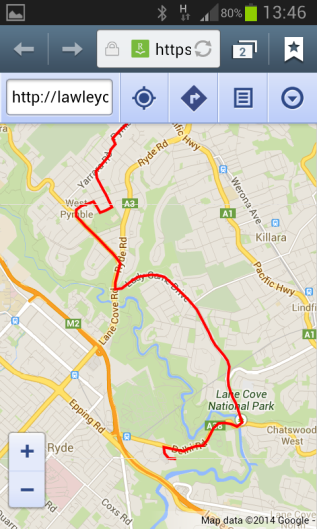 Fixed Camera button not enabled if opening with MyBike. Simply Download the App from Google’s Play Store. 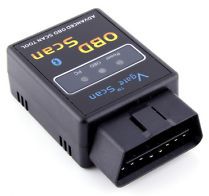 Take the 4-pin to OBDii adapter cable originally supplied with the OT-2 and connect it to the bikes diagnostic port. 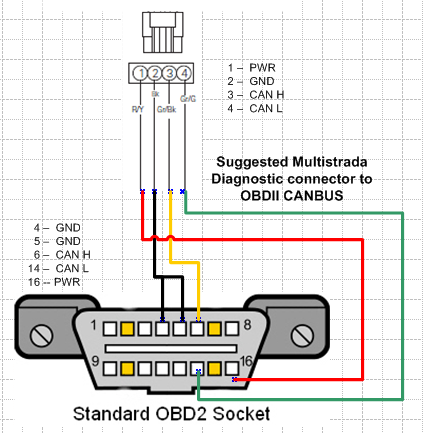 Now plug your BlueTooth or WIFi ELM327 into the ODBII port. It should power up straight away, and you can ‘pair’ and connect to it with your phone. TuneBoy users can use the same adapter cable that came with your TuneBoy hardware. NOTE: Non TuneBoy users will have to make their own adapter cable. An adapter cable will be needed to go between the Diagnostic plug and your ELM327. A suggested cct is provided. 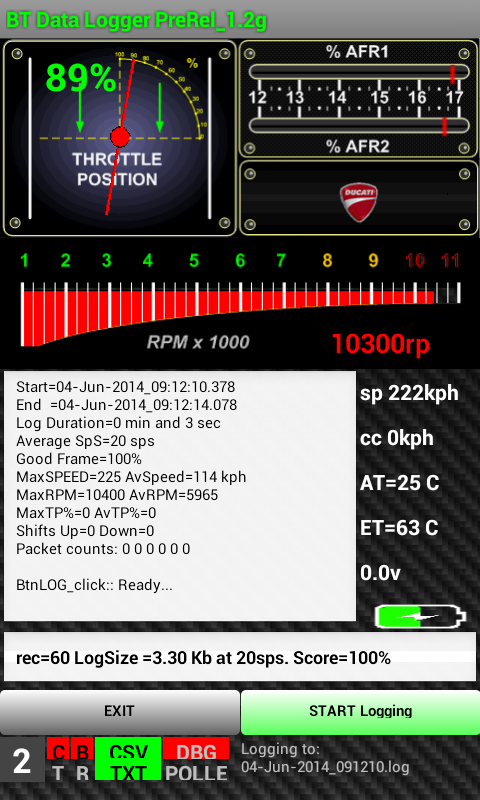 Any standard OBD2 socket can be used. Warning: Pin1 (PWR) is always live on the bike. Warning: Be very careful of the pin out. Test it carefully with a multi meter before connection. Warning: You are making this cable of your own free will. Warning: the PWR pin is always live (+12v), even if the bike is off. Warning: the color codes in the diagram are simply to allow for easier reading and may have NO RESEMBLANCE to the colors of the wires in the cable you have purchased. At present there are still a number of BUGs to resolve. 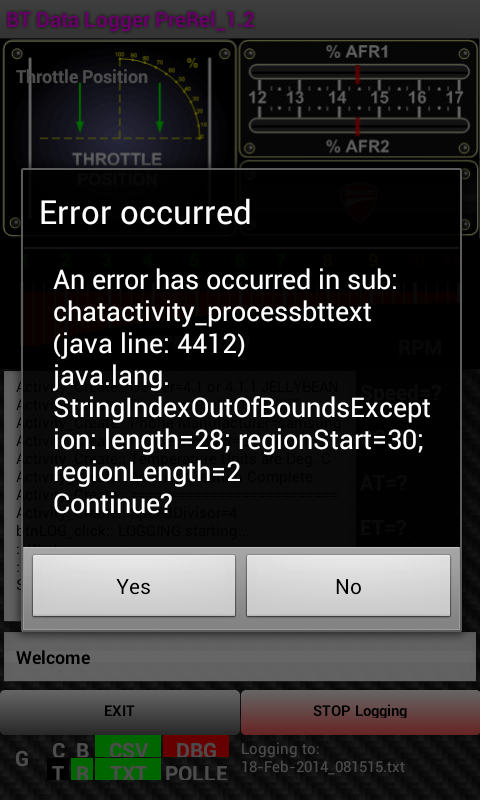 Sometimes the App crashes with an exception message. There are many reasons for these and a screen shot of it, can help me identify where it’s happening, so I can try to trap it in a later release. If you’re wanting to report problems to me, please include the stats file and a screenshot with your description of the issue. 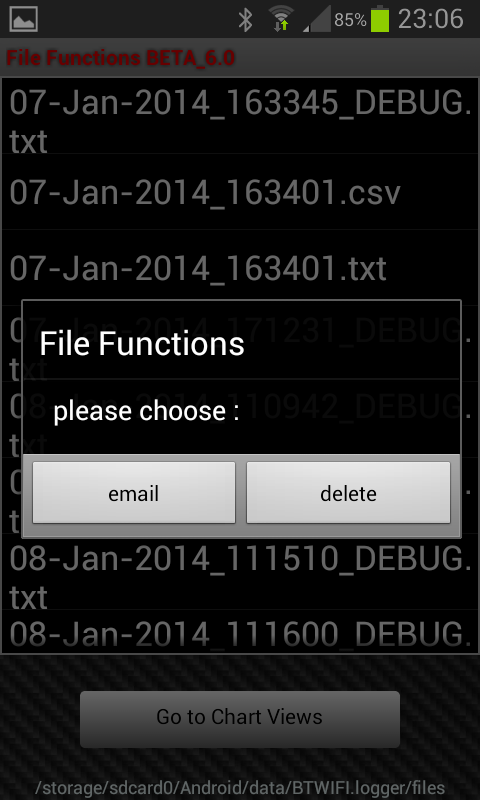 Try enabling DEBUG mode, reproduce the error and send me the DEBUG file as well as the .TXT trace file. It has been terrific to have such a meaty project to get involved with as my first dabble with Android development, Bluetooth data, WiFi connections, Canbus operation and of course … just f**king with my Multi in general. 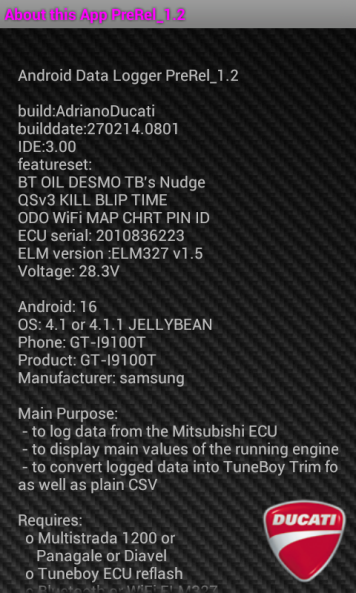 This App would not have been possible without the patience, support and guidance of Wayne from TuneBoy.com.au, in providing the data, and much advice and education on using the ELM 327 and Canbus operation. Also the B4A user community at large for help with various aspects of Android Development. 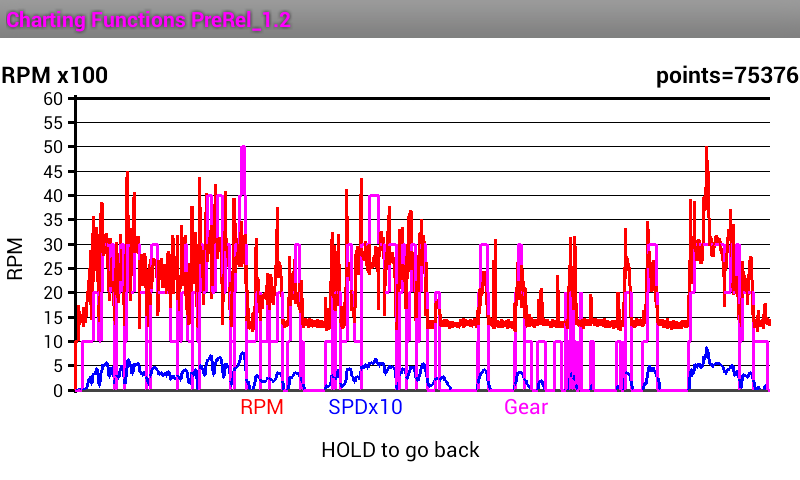 The Charting functions are primitive, but do allow you to check various readings whiles still out and about on the bike, ie: without having to download your CSV file and graph it in Excel. 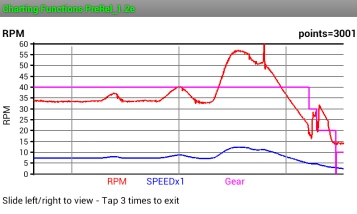 The Temp chart simply shows Air temp and Engine temperature. 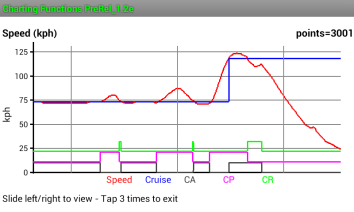 Charts width now scales (to a point), to be wider than the screen, to alleviate ‘crowding’ of the data. Drag the chart left / right with your finger. Note: this charts is showing the AFR reading from my QS and Nudge Buttons. 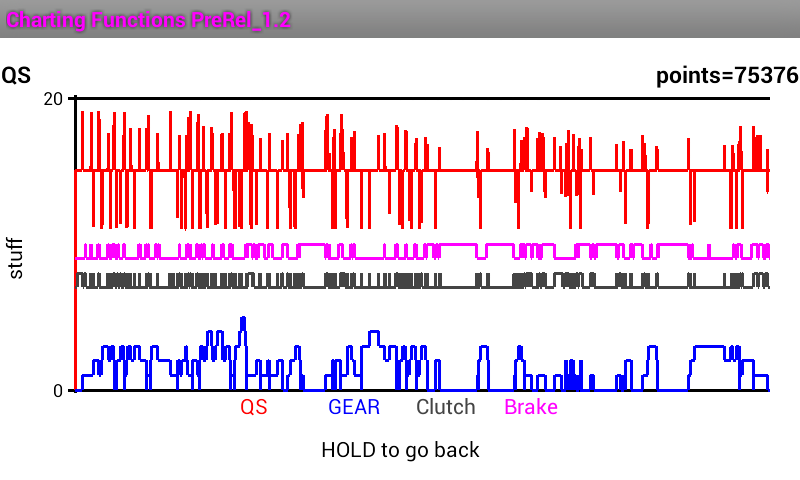 If the QS is being used you would expect to see QS pulses up or down, and Gears stepping up or down, but no corresponding Clutch activation. BAL maps the difference between Cyl1 and Cyl2 MAP. In theory, you would expect this to work out to be roughly a straight line. Also still working on it …. 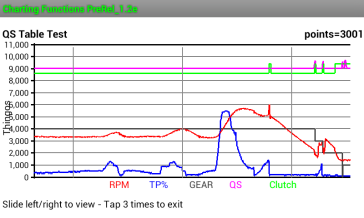 As you see, I have no trim adjustments form bike. If you have stopped logging, you can back out to the ‘About’ screen and see a short summary of that logging run. Clicking the Emblem in the lower right hand corner will open these in your email application ready for emailing. 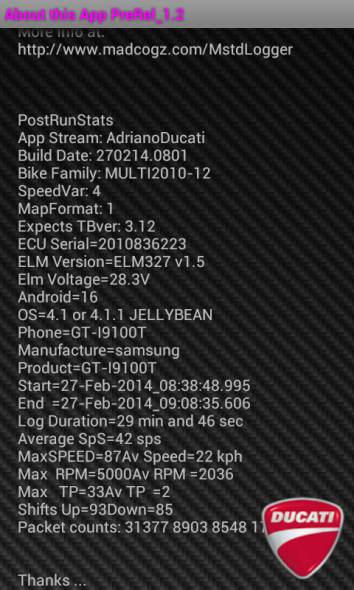 Contains information about your Android Device, as well as some of the Max and Average values from your run. (Don’t be too worried if the ELM voltage is reported as something weird.. I think some ELM’s are a bit flakey with this). Touch the Ducati Icon to open the eMail function. To make use of the ODO winding feature, you must first disconnect the BBS. This connector has a ‘push’ tab on it’s face, facing the center of the bike. To release it, reach under the plastic duct and push the tab, with a finger, outwards to the LHS of the bike, while wiggling the connector itself, forward, and off. Do not try and start your bike with the BBS disconnected !!! Now swipe the gauges left to right. ! 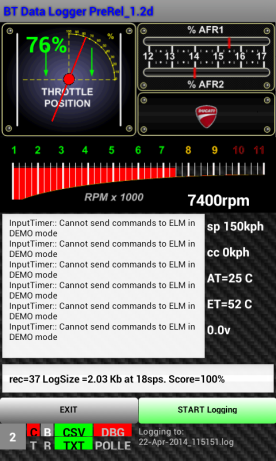 Note: If you’ve just changed to ‘STOP Logging’, it will take 2-3- seconds before the App is ready to send commands to the bike like this. 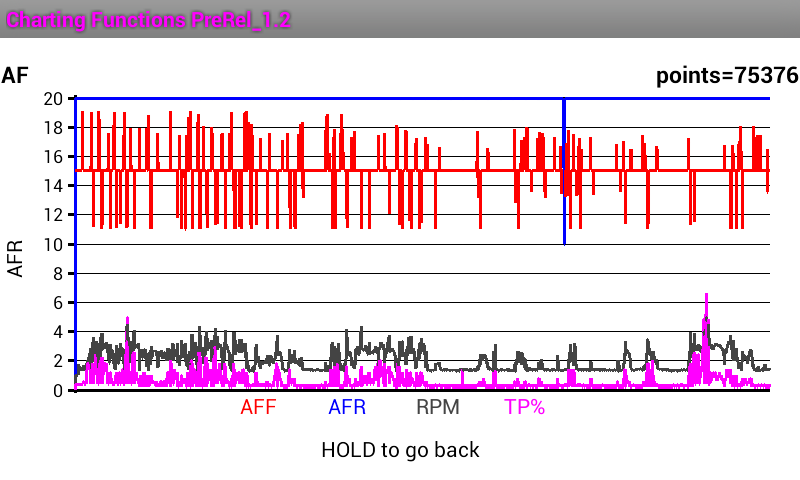 If this function does not work for your bike, the 1st likely culprit to look into are your BLIP H and BLIP L tables in TuneBoyTrim. (They are probably all ‘0’). They need to have sensible values ! It has been reported ands confirmed that the ‘About screen will cause an error if accessed before MultiTool has had a chance to read anything from the bike. The following Android devices are undergoing testing. MultiToolTB does not help when you are 1600km from home and snap a pannier off !! !